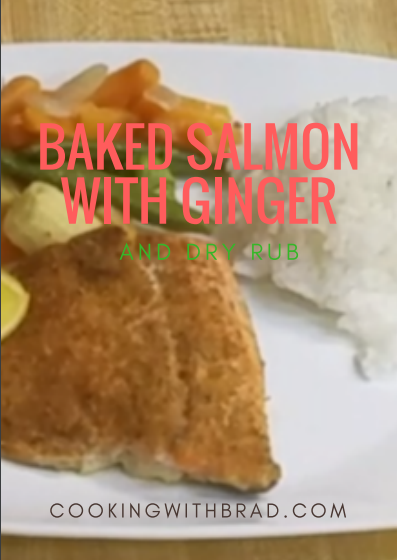 Here is one of my best Recipe for Baked Salmon with Ginger and a dry rub. Making salmon is so easy it should be on the top of your list for what to bake for dinner. The fillets that I am using came from Trader Joe’s and are boneless, which means that the pin bone’s have been removed for you. There for you don’t need to spend time removing them. If your not a fan of Parchment paper you need to try using it for an easy clean up. Click the link to read about the history of this fantastic paper. To repeat what was said in the video, freezing the ginger is a great way to keep it fresh and super easy to grate the ginger in to any dish that you may be making. Plain whit rice and a vegetable melody rounds out this dish. If you can’t find the rub in the video you can also use Al’s perfect dry rub found by clicking this link. Watch the video below to see just how easy this dish is to make.